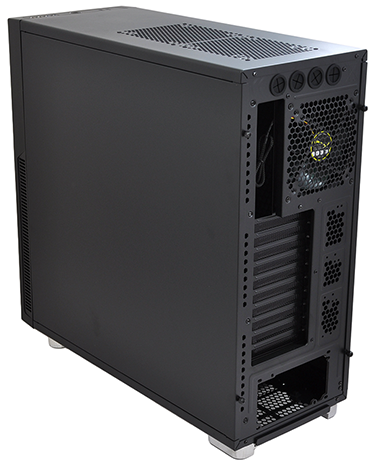 Taking on the established names in the PC component space is easier said than done, but it's always good to see newcomers find success and a few have done just that in the field of performance chassis. The likes of NZXT and Fractal Design are good examples, and looking to join those ranks is Nanoxia. The German outfit, founded in 2012, has quickly grown in popularity amongst enthusiast users and that's partially down the company's decision to focus on a very particular section of the market. Rather than ride the performance bandwagon, Nanoxia reckons there to be "a lack of quality, quiet PC cases available," and set out to produce "products that are high-performing, long lasting, and built for silence." Sounds like our cup of tea, so we've got the company's Deep Silence 5 Rev. B in for review. Priced at just under £115, this is the first Nanoxia chassis to pass under the HEXUS spotlight but it already looks familiar due to its resemblance to Fractal Design's Define Series. There's no relationship between the two companies, as far as we can tell, but it makes sense for there to be similarities in design as both are aiming for the same audience of quiet-computing aficionados. What's more surprising is the Deep Silence Rev 5's sheer size and weight. When you think quiet you automatically assume small, but this is no shrinking violet. 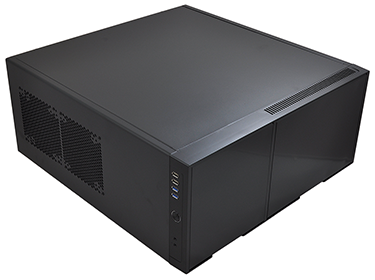 The case measures 552mm (H) x 232mm (W) x 550mm (D) and tips the scales at a hefty 16.2kg, making it a proper full-tower solution. Colour choices include Dark Black (pictured), Anthracite or White, and there's a common theme running through all the chassis on Nanoxia's product range. Each enclosure takes a simplistic approach to aesthetic design, favouring clean lines over aggressive angles, and there isn't a great deal of interest to what's essentially a classic outlook. A row of I/O ports are positioned across the front-top edge, with dual audio ports and four USB (2x 2.0, 2x 3.0) flanking the central power button. The latter is backed by a green LED that's a little off-putting, but green is a recurring theme and you'll see more of it when we move inside the chassis. The steel structure combines with the plastic front fascia to deliver reasonable build quality, and it's in the plastic section that the bulk of the exterior action takes place. 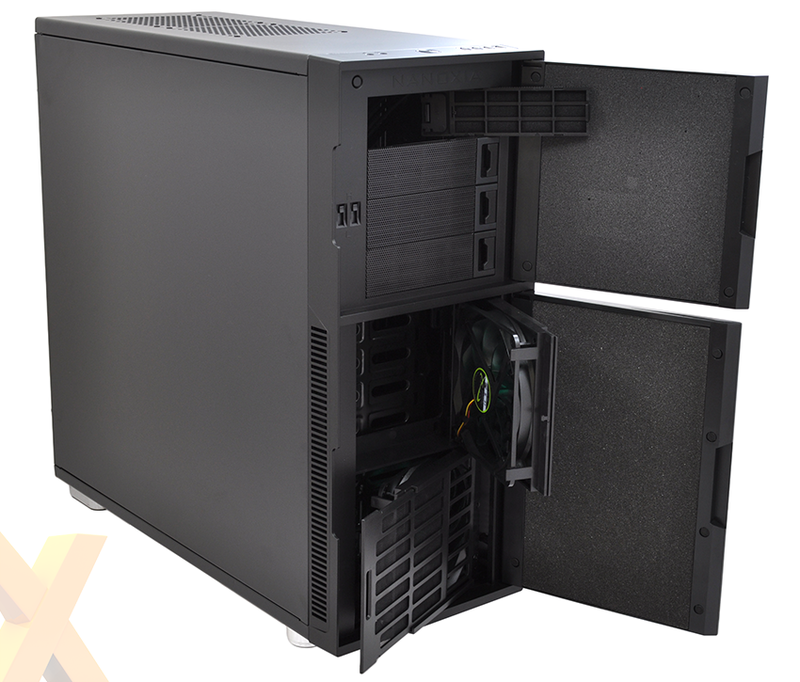 Unusually, Nanoxia has the front door split into two - a top door encompassing the optical drive bays and a lower door covering the front intake fans. We might have preferred a single, seamless entry point if we're honest, but the two-way configuration does offer something a little different to the norm. Opening the duo provides a first glimpse at Nanoxia's determination to keep things quiet and filtered. Each door is lined with sound-proofing material, but going beyond the basics it's nice to see that each 5.25in optical bay cover is also filtered for good measure. We see a similar approach with the pair of 140mm front intakes, both of which are topped with a removable filter and are installed on a push-to-release hinge that allows for easy cleaning. There's good attention to detail, but the plastic nature of this front section leaves certain elements feeling fragile. Unfortunately, the push-to-release mechanism on our review sample's bottom fan has already broken, and though you're unlikely to open this section on a regular basis, it is the area most unlikely to stand the test of time. Another feature of interest is the two small sliders positioned alongside the optical bays. 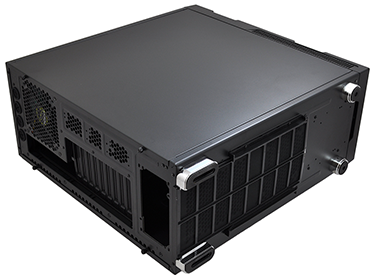 Designed to modulate fan speed, each control is backed by a trio of three-pin fan headers, allowing the user to quickly regulate the speed of up to six fans.